Norma A. Ridener, 78, of Toledo, following a courageous battle against Parkinson’s Disease, passed away Sunday, February 3, 2019 at her residence with her husband at her side. A Bowling Green University graduate, she was a member of the first teaching staff at Penta County Joint Vocational school. She prepared more that 450 senior students to enter the professional office world from 1965 to her retirement in June 1998. She also taught word processing at Monroe Community College for several years. In addition to her job in education, she also worked in numerous offices doing secretarial work which included Dana Corp and Teledyne Corp.
She was born Norma Anna Rohloff on October 7, 1940 in Pemberville, OH to Louis Ernest and Mary Johanna (Maas) Rohloff. On August 8, 1974 she married Martin T. Ridener in Toledo and they have celebrated nearly 45 years of marriage together. Norma was an accomplished musician and had been the organist and pianist at several local churches the most recent being First St. John in Toledo, where she and Martin attended. In her free time, she thoroughly enjoyed playing bridge and golf with her husband and retired teacher friends. In addition to her husband Martin, Norma is survived by her sister: Arloa (Rodney) Williams of Toledo, cousins: Brenda (Kenneth) Walsh of PA, Phil (Janet) Frawley of Toledo, sister-in-law: Mary Rohloff of Toledo and many other cousins. She was preceded in death by her parents, brother: Rev. Richard Rohloff and sister: Marsha Rohloff. Family and friends will be received at a Memorial Service 11 a.m., Saturday, February 16, 2019 at First St. John Lutheran Church, 2471 Seamen St., Toledo OH. with Rev. Jerald Rayl, officiating. A bereavement luncheon will be served in the church fellowship hall immediately following the service. The family requests, that in lieu of flowers, memorials take the form of contributions to: First St. John Lutheran Church. Those wishing to express a word of encouragement, share a memory or photo may do so at www.marshfuneralhomes.com. To send flowers or a remembrance gift to the family of Norma A Ridener, please visit our Tribute Store. A bereavement luncheon will be served in the church fellowship hall immediately following the service. 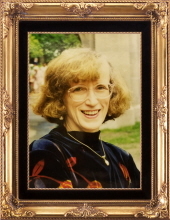 "Email Address" would like to share the life celebration of Norma A Ridener. Click on the "link" to go to share a favorite memory or leave a condolence message for the family.